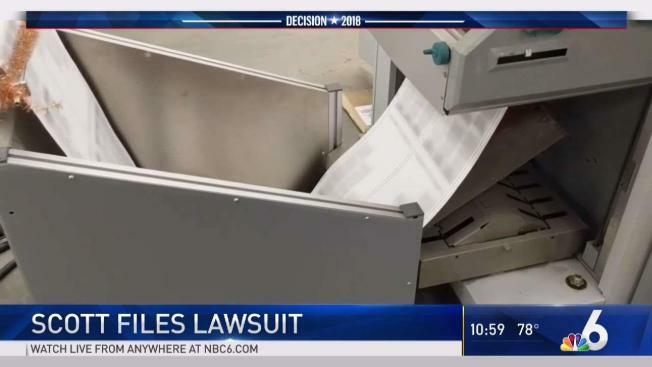 NBC 6's Johnny Archer and Laura Rodriguez give the latest on the recount drama in Florida's Senate and governor's races. As Florida's election for U.S. Senate tightened enough to require a hand recount, the race for who will be the state’s next governor appears to be headed to a recount as well. As of Friday morning, Republican candidate Ron DeSantis had a lead of just over 36,000 votes over his Democratic opponent, Andrew Gillum, out of more than 8 million votes cast, according to the latest tally by the Florida Division of Elections Office. That puts their vote totals within 0.43 percent of each other, just under the half a percentage point needed to trigger a state-mandated recount. The need for a recount will be determined this weekend by Florida Secretary of State Ken Detzner after the canvassing boards in each of the state's 67 counties certify their returns. If ordered, the recount would likely begin Monday. Gillum conceded the election to DeSantis, a former member of the U.S. House of Representatives from Jacksonville, who won in part due to the backing of President Donald Trump, but could still ask for the recount to continue under state law. His campaign said Thursday, before the race tightented to within the 0.5 percent mandatory recount requirement, that it is "ready for any outcome." "On Tuesday night, the Gillum for Governor campaign operated with the best information available about the number of outstanding ballots left to count. Since that time, it has become clear there are many more uncounted ballots than was originally reported," communications directior Johanna Cervone said in a statement. "Mayor Gillum started his campaign for the people, and we are committed to ensuring every single vote in Florida is counted." DeSantis continues to move forward as the presumptive governor. He appointed a transition team Wednesday and briefly addressed the recount possibility during an appearance in Hialeah Gardens Thursday. "I'm proud to have been elected on Tuesday night, it's a great honor, we're working really hard on the transition, we'll let the lawyers do what they gotta do, but we're good and I'm looking forward to serving," DeSantis said. In the Senate count, Republican candidate and current Gov. Rick Scott leads by just over 15,000 votes — 0.18 percent — over three-term Sen. Bill Nelson, a Democrat. If that number remains under one quarter of a percentage point, Detzner will order a manual recount in each county. Nelson's elections lawyer on Thursday predicted it would be a "jump ball" to decide the race. Elections officials in Broward County, where Democrats have a large advantage, were still counting votes Thursday and were scheduled to continue Friday afternoon. As outgoing governor, Scott said at a news conference Thursday night that he was ordering the Florida Department of Law Enforcement to investigate elections offices in the Democratic strongholds of Palm Beach and Broward counties, accusing officials of failing to certify results while they continue to seek ballots for the results they want, the Associated Press reported. Meanwhile, Senate candidate Scott filed a lawsuit demanding that the Broward County supervisor of elections be ordered to turn over several records detailing the counting and collection of ballots cast. Both Gillum and Nelson have the right to deny a recount, as state law allows the trailing candidate to concede. A third race, for the state's agriculture commissioner, is also likely heading to a recount. Republican Matt Caldwell had held a slim lead over Democrat Nikki Fried since Tuesday, but her vote total surpassed his on Thursday afternoon, when she led by nearly 3,000 votes, according to the Elections Office. Thousands of provisional ballots will begin to be counted Thursday across the state as well as mail-in votes and some early votes that have still yet to be counted. Rejected ballots will be examined by counting teams to determine if the voters' intentions were obvious. If either side objects to a counting team's decision or the team can't make a decision, the ballot will be forwarded to the county's canvassing board, with the three members voting on the final decision. The members are the county supervisor of elections, a judge and the chair of the county commissioners. The process is expected to be finished by Nov. 18, with the state certifying results of the elections two days later. Chris Hartline, a spokesman for Scott's campaign, criticized the Nelson campaign for pushing for a recount instead of conceding. Scott gave a victory speech late Tuesday. "This race is over," Hartline said. "It's a sad way for Bill Nelson to end his career. He is desperately trying to hold on to something that no longer exists." Nelson and his campaign staff say they intend to let the process proceed and will have monitors in every county. Late Wednesday, an attorney for Nelson said he intends to aggressively examine and address reports of ballot problems. The Nelson campaign believes the results of the election are still unknown since there are ballots yet to be counted, Marc Elias said in a statement. "We're doing this not just because it's automatic, but we're doing it to win," Elias said. The process, if it goes forward, will be different than the one that gained international notoriety in 2000, when the Supreme Court ordered an end to vote counting in Florida after a month, allowing Republican George W. Bush to claim the presidency with 537 votes. At the time, each county had its own voting system. Many used punch cards — voters poked out chads, leaving tiny holes in their ballots representing their candidates. Some voters, however, didn't fully punch out the presidential chad or gave it just a little push. Those hanging and dimpled chads had to be examined by the canvassing boards, a lengthy and tiresome process that became fodder for late-night comedians. Now, all Florida counties use ballots where voters use a pen to fill in a bubble next to their candidate's name, much like a student does when taking a multiple-choice test. When voters finish marking their ballots, they run them through a scanning machine that records the count. The ballot is stored inside the machine. If the recount happens, each county will again run each Senate ballot through a scanner under the watchful eye of representatives of both sides. Ballots that cannot be read because they aren't marked or mismarked will be set aside.